The Galaxy Note has been out for a while internationally, but now it is headed to U.S. shores. Exclusive to AT&T’s 4G LTE network, the Galaxy Note uses a Wacom-made “S Pen” for note-taking and drawing. Wacom pens recognize both right-handed and left-handed users. It also mimics the act of physically taking notes: The harder you press the pen down on the Note, the more bold your lines will be. Samsung has yet to announce pricing and availability for the Galaxy Note. We got a sneak peek at the Galaxy Note last night before today’s AT&T press conference. The 5.3-inch 1280-by-800 resolution HD Super AMOLED display puts the Note in an interesting place between a phone and a tablet. According to Samsung, there won’t be an unlocked version of the Note in the U.S., which puts it more in the subsidized phone with contract category. 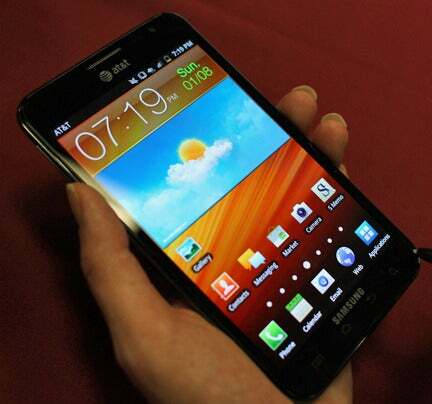 The Galaxy Note runs the latest version of Android Gingerbread 2.3.6 with a similar version of TouchWiz to the Galaxy S II line of phones. As you might expect, the Galaxy Note has built-in software and special gestures for the pen. To pull up the notepad, you hold down the button on the pen and double tap on the display. If you have another app open, the notepad appears on top of it allowing you to easily switch back to it. You can also take screenshots by simply pressing and holding the pen to whatever you want to capture. You shot then opens in a simple photo editing app, which lets you crop the screenshot in either lasso or rectangle mode. Writing on the Galaxy Note takes some getting used to. At first, I was appalled at how horrible my handwriting looked. Once I got the hang of using the pen though, I started to enjoy it. As somebody who is constantly doodling and prefers writing down notes to typing them, I could see myself using the Note in meetings or for my personal use. You can change the color of your font, erase it and add text. The Galaxy Note is powered by a 1.5GHz dual-core processor and seemed pretty speedy throughout. There were times, however, when I was writing something, it didn’t register right away and I had to rewrite. The 8-megapixel camera took pretty good pictures in the oddly-lit Riviera Casino where my briefing was held. I have to say, however, it feels a little silly using something of this size as a phone. It isn’t like holding an iPhone up to your face, but it does feel a little unwieldy. It is light enough, but a bit too wide for my hands. Samsung has not yet released the exact dimensions of the US version of the Galaxy Note. Samsung says that the SDK for the Galaxy Note and S Pen will be available to developers soon (though they couldn’t say exactly when). I see a lot of potential for creative and productivity apps as well as games that incorporate the S Pen (think Nintendo DS-style games). Stay tuned for more phone and other tech news out of Las Vegas and be sure to follow us on Twitter @pcworld for the latest news and gadgets.